NZ Book Month Pop Ups! I have a friend who is an engineer, and I am an artist. She and I have vastly differering jobs but last night I almost ventured into her world. With paper. 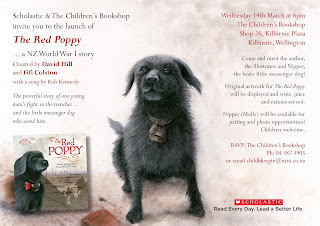 It was a New Zealand Book Month event run by The Wellington Children’s Book Association and featured the wonderful collector of pop-up books (amongst other interesting antiquities) Trevor Morley and myself. Trevor has a fantastic collection of books from rare collector's items by Ernest Nister through to amazing Star Wars pop ups complete with light sabres! The young boys in the audience were entranced by the books and all thoughts of Playstation were gone from their heads as they contemplated the mechanics involved in the engineering before them. Trevor also had an 'Adult' selection which required a driver’s license and proof of age to view. Much giggling was heard in the corner (oh, was that from me?) as pop ups of all sorts abounded. Trevor was a former vice squad cop, so he was at pains to make sure that no one was accidentally offended or over educated by a mistaken viewing. 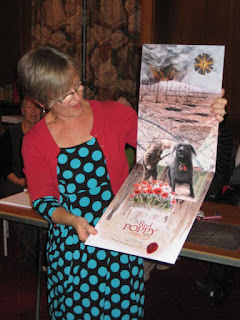 I turned my hand to simple engineering and showed how to make words pop up to make simple and effective greeting cards, then went on to a larger project; making a pop up diorama of The Red Poppy; the book that has occupied my illustration career for a few months past. Everyone got to make a smaller black and white version of it too, with the help of the Storylines scissors and glue sticks kit that we use each year for arts and crafts at the festival day. I promised the enthusiastic audience some links to useful sites that show how to make pop ups. Popular Kinetics is another useful site- I particularly like the ‘make your own Occupy tent’ one. This site has lots of card ideas- just click on all the pages and occupy yourself for hours! 1) Download the pictures below and print out 2 copies of the background image and one of the characters. The line image is a guide for tracing onto the back of one of the backgrounds. 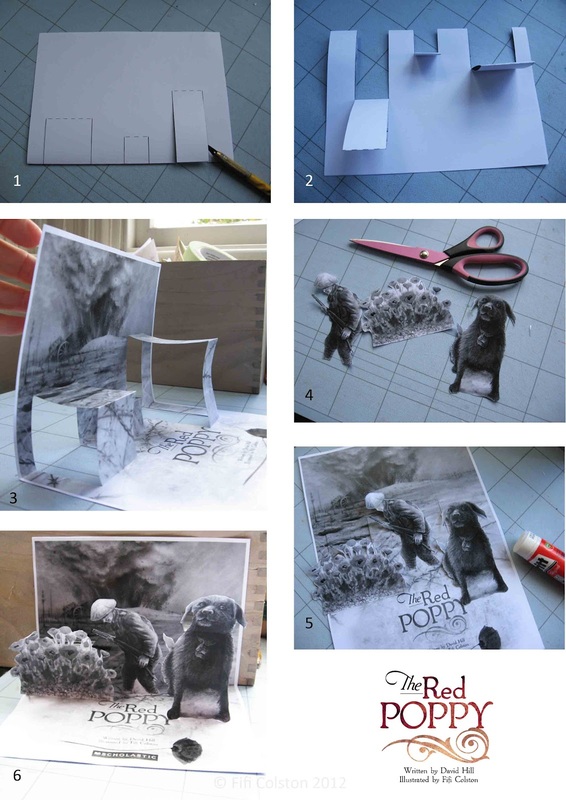 2) Fold and crease the backgrounds images in half one way and then the other so they it fold easily either way. 5) Open it up and push the cut areas out so they form box shapes; this is what you'll glue your other character pieces to. Lay it down flat again for the next bit. 6) Cut out Jim, Nipper and the poppies and glue them to the front of the 'boxes' you have pushed out. 7) Glue the other background to the back of the pop up, making sure you don't glue it to the box parts that pop out! 8) Open it all up and there you go! 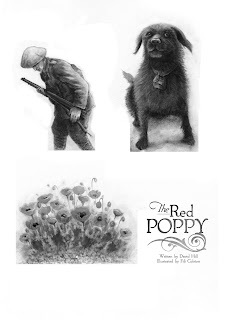 Jim on the battlefield heading towards the patch of poppies in No Man's Land and Nipper the brave little messenger dog, waiting to rescue him! Happy NZ Book Month everyone! We have found no less than 7 layers of wallpaper paint and scrim; each telling its own particular story. This is more exciting for me than the prospect of a new kitchen (in which I will have no more excuses not to cook). The minister of Internal Affairs approved the Y.M.C.A to hold a public appeal for funds to assist their war work. It was decided that the appeal would be known as "Red Triangle Day" to be held on March 15th, 1917. 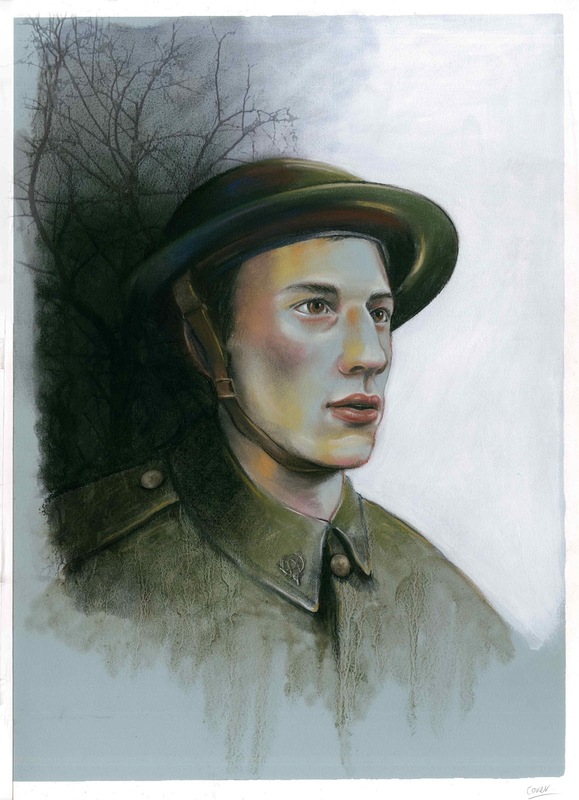 The YMCA undertook considerable work within New Zealand and especially overseas during the war, providing Christian based home comforts, accommodation, social and recreational facilities and entertainment, convalescent facilities, and canteens. Providing Christian based facilities and fellowship was seen as a necessary alternative to safeguard soldiers from often immoral and corrupting alternatives. It is serendipitous (and just a little spooky) that we found the badge this week, and our Anzac book launch is today, March 14th, 95 years later almost to the day. I like to think it is a sign from the universe that our efforts are being recognised and those soldiers who were thrown to the lions in WW1 approve. We live today, as they would have hoped, in a country unaffected by the hardship and terror of war; long may it continue. My husband’s grandfather Rothwell, wrote postcards to his fiancé Hilda, from 1914-1918. Particularly poignant were two from France; they said simply “Am O.K” and “Keep smiling!” I was in the process of scanning and blogging these cards for the family when Scholastic asked me if I would look at a very special story to illustrate. I had decided some time ago that the next book I illustrated had to really mean something to me on a very personal level. Illustrating a book is a labour of love and I wanted to make a body of work that would enthral me and push me to produce as excellent work as I could. For that I’d need to relate to the story; it had to move me. Then I read David’s manuscript. 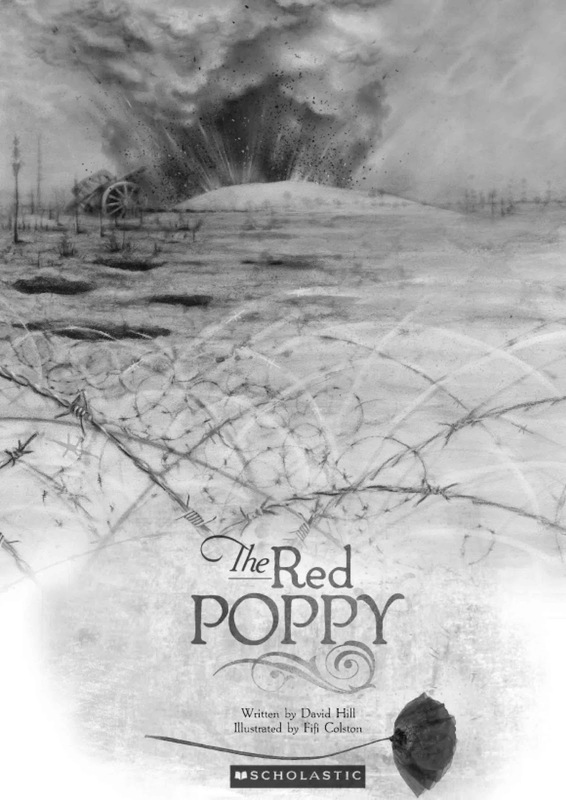 Jim’s letter home never mentioning the horrors of the trenches struck an immediate chord with me; those cheerful words from a young man, disguising the reality of his situation. Rothwell did come home from France to be a husband and father, but was far from ‘o.k’; dying just a few short years later from the cruel ravages of his war experience. Illustrating this book has been a journey through his time for me. I visited war museums, studied WW1 uniform, grew red poppies, photographed mud and rubbed chalk pastel until my fingers bled. I have learned much and my artwork is a tribute to him. It’s been a real pleasure working with David, Diana and Penny at Scholastic and Penny Newman the brilliant book designer who created the vision with me.